The Chuck Wagon Race is an exciting event to watch at the Calgary Stampede in Alberta, Canada. Every year at the Calgary Stampede in Calgary, Alberta the sport of the Chuck Wagon Race is watched by thousands. People love to watch the horses harnessed up to the chuck wagon as they race around the track amongst barrel obstacles without losing their wagon. Chuck Wagon Race, Calgary Stampede, Calgary, Alberta, Canada, North America. 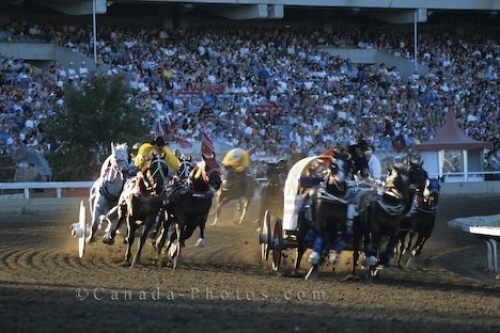 Photo of the Chuck Wagon Race at the Calgary Stampede in Alberta, Canada.